Our organization is part of the world Communist movement. It became established from 1962 onwards, when J. Posadas and the Latin American Bureau of the IV International broke from the international leadership of those days. The idea was to stay, on a one hand, faithful to the programmes and the aims of the organization that Trotsky had founded in 1938; and on the other hand, to participate fully in the organization of the new forces of the revolution. These appeared after the Second World War, through the triumph of the Soviet Union and the powerful development of the colonial revolution. All the continents saw the creation of new Workers States and Revolutionary States. The Posadist Fourth International is convinced that the many-sided antagonisms between the capitalist system and the world revolution cannot be solved other than by the advent of a new world socialist society. This demands the abolition of capitalism, but this regime will not quit the scene of history without employing all the means to remain, the atomic war included. The dismantlement of the Soviet Union and socialist camp has led to a deep crisis of identity within the general Communist movement. It is imperative to reflect, analyze and assess not only the historic function of the Workers States, but the conditions necessary for them to recover and start spreading to the entire world the bases and structures that lead to socialism. J. Posadas’ elaborations around “the Partial Regeneration of the Soviet Union and of the Workers States” enrich Trotsky’s concepts of “the Revolution Betrayed” and of “the Political Revolution”. These are precious contributions to the construction of tomorrow’s socialist society. As a method of thought and action, Marxism guides our movement. History is that of the class struggle, and the proletariat remains the engine of social transformation. Today, the immense majority of the popular masses have become ‘proletarianised’ so to say. The idea of socialism wins important sectors of the petit bourgeoisie and even of the bourgeoisie. As Trotsky and Posadas analysed it, the world is ready for socialism and the only crisis for socialism is its crisis of leadership. To build this leadership was the reason for being of the IV International since its foundation, and this is still the case today. The death of J. Posadas in 1981 was a great loss for Marxist thought and action. The texts he elaborated right up to the last moment remain of brilliant topicality. They are a rich contribution to the understanding of the world today, and to the construction of socialism. The publication of his complete works is one of the main aims of this site. This site informs also on the positions and actions of the Posadist Movement Today. Wherever the latter intervenes, it intends to participate in the construction of the new International that incorporates all the revolutionary forces of Humanity. Who is J. Posadas ? J. Posadas was born in Argentina in 1912 and died in Italy in 1981. He was all at once orator, writer, political leader and revolutionary organizer. He started his militant activities as a Trade Union leader who quickly adopted the ideas of Trotsky. In 1947, he organized the Grupo IV Internacional (GCI) and created VOZ PROLETARIA, an Argentine paper focused on the Peronist process in the early days of nationalism. 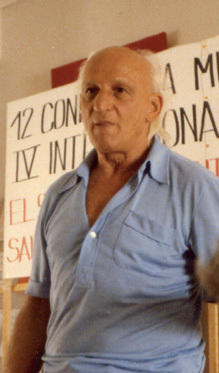 Following this, he developed Trotskyist sections in several Latin American countries and created the BLA – the Latin American Bureau of the IV International. He was a member of the International Secretariat of the IV International until 1962. J. Posadas enriched Trotsky’s principle of the permanent revolution when he detected revolutionary nationalism in early Peronism (in Argentina) and then in the whole of Latin America - as well as in many countries of the world that were casting out the yoke of colonial oppression. J. Posadas made an essential contribution when he grasped that these nationalist movements, such as they were developing, formed part of a post-Second World War revolutionary process - with its centre still in the Soviet Union. In thoughts and actions, J. Posadas was always true to the unconditional defense of the Workers State. This enabled him to elaborate concepts such as the partial regeneration in the Workers State, the Revolutionary State, the historic antagonism between capitalism and the Workers States, and the inevitability of the atomic war. In the field of Art, of Science and of Culture in general, J. Posadas has left many writings that enrich the Marxist conception as applied to the human relations and the Communist future of Humanity. The works of J. Posadas and the example of his life are contributions to the sense of confidence that, in his own words, “Socialism is not just a necessity of history but a necessity of life”. ©2019 - Posadist fourth international. All rights reserved.